The Feral Turtle: Closet Befores....a little late, cuz I forgot I had all these pictures! Clearly you need a drink of water. :) I see nothing wrong with Mr. FT's side and your side. Looks perfect if you ask me. I do love a blingy chandelier in the closet. Too much fun! The Mister keep threatening me with a revamp of our closet...but I tell him, then where will my giant pile of clothes that I no longer wear and just stack in that corner, go? Yeah....I thought so. Wow! This is a great closet! I love, love the lamp. 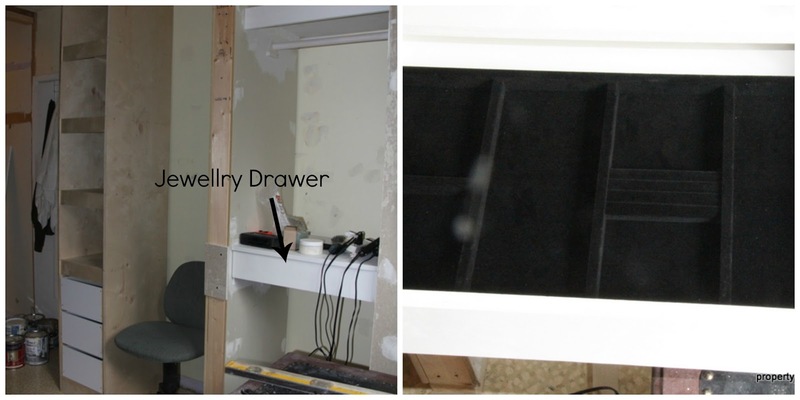 About the jewellery drawer, have you tried storing your drill there? Clearly it's like a jewel for you! Dang, I was about to go on a popcorn ceiling tirade and you told me not to... Truth: I didn't notice the popcorn, I was too busy ogling your medallion and light fixture. Nice! Look at you go, go, go! You are really making progress on that room. I love that you are building a custom closet. We got lazy with our girls and ended up buying a closet kit from the hardware store when they jacked the prices really low. I do love them, but some days I wish we would have just taken the time to build it the way we wanted like you are now doing. Wow... I can't believe how much you guys are getting done. It's amazing! Now I've got serious closet envy. I am closet deprived here in this old house. They're so small and quirky. We have gotten used to it, but now you've got me thinking that I need to expand my closet horizons. Love, love, love that you put such a fabulous light in there. How cool is that? I love the light and that you have to use mr FT closet :) I'm tired thinking about how much work you've been doing n there. I actually don't mind popcorn ceiling. What a gorgeous light Karen - and an incredible price! You put me to shame with your reno's..................I'm feeling completely inadequate right about now ! Wow, you two are making amazing changes in that house. That light fixture looks fabulous, as does the medallion. As for the popcorn, I take mine buttered, please and thank you. Your are bringing a cozy elegance to every aspect of the remodeling that you are doing both in the dormer and the master suite. Thank you for the inspiration. Wow! Do you ever sleep???? I love that light and I'm envious of your closet. I had huge plans for building out mine and then gave in and got wire shelving just to hurry things along and get moved in. I'm sure yours will inspire me to makeover that mess! Wow, what a closet! You've come a looong way! I love how you divided the space, it's great to have your own space. That light is gorgeous, really nice price! So fun to see your progress. Love the light!